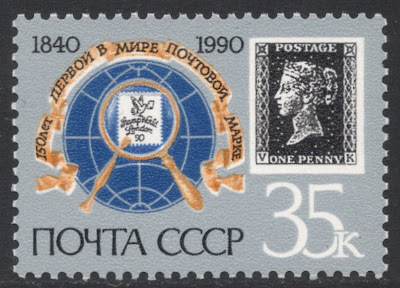 In 1990, the Soviet Union marked the 150th anniversary of the first stamp in the world, the Penny Black, quite lavishly with a large array of philatelic items. On 15 February of that year, a stamp set of three values was issued. 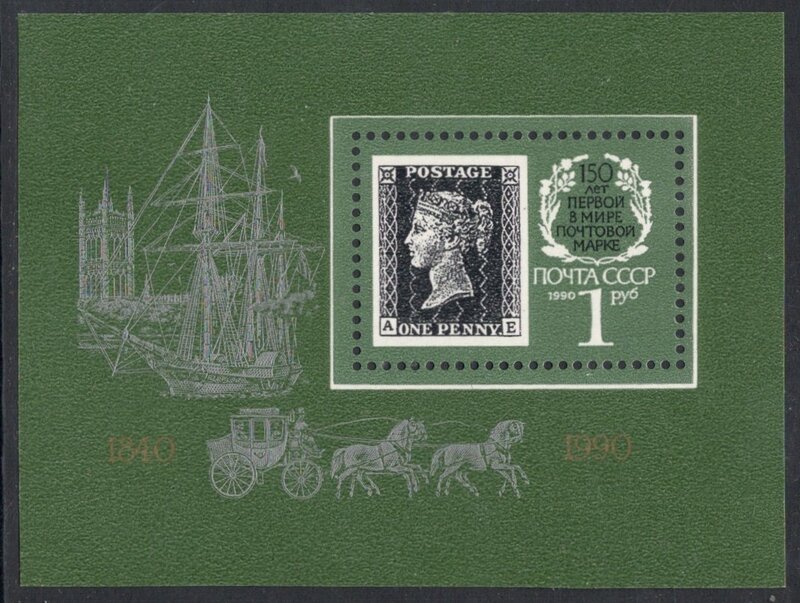 They all included an illustration of the Penny Black alongside a variety of designs. The 10k depicted a posthorn, a paddle-steamer (probably a mail-carrying one?) and various flowers. 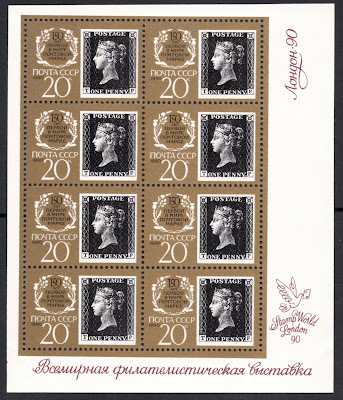 The flowers become more obviously some of the regional symbols of Great Britain on the 20k value, with at least the thistle and possibly a rose being discernable. 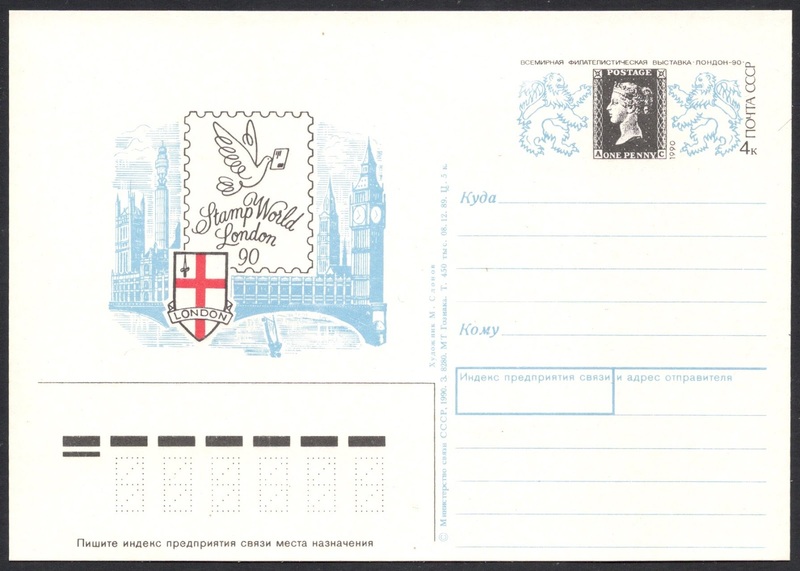 The 35k includes the logo of the Stamp World London '90 international stamp exhibition. Al these stamps were available in regular counter sheets of 50 but the 20k also came in sheetlets of eight, which again included the exhibition's logo. 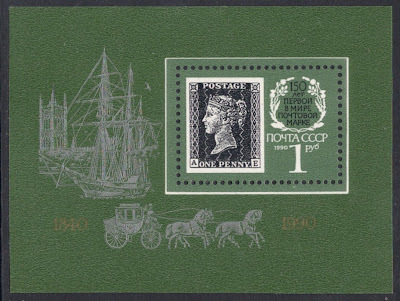 Better still, the set was augmented with a miniature sheet, which included a stamp designed along the same lines as those in the stamp set and some more (postal) illustrations with this time a distinct British feel to them, recess-printed in the margin. 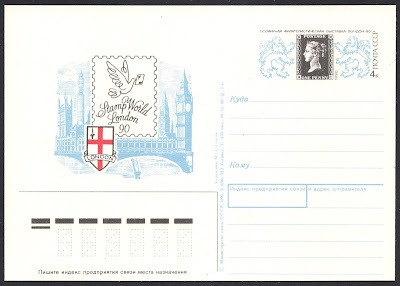 Finally, a special commemorative postal card was issued as well, again obviously incorporating the Penny Black, this time supported by two Lions Rampant, and with some additional London landmarks on the left, including the shield of the City of London. One cannot really blame the Soviets for this, of course, but the exhibition was held in Alexandra Palace, which is not in the City of London. So far what we have here is a great addition to any Penny Black Anniversary collection, or a collection of Stamp World items. But there is more. 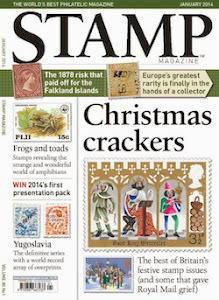 There is a twist to the story which would not look amiss in Stamp Magazine's monthly 'Strange but True' column! 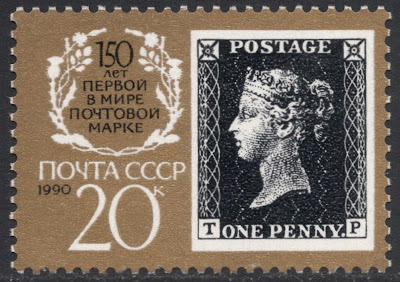 The thing is that each and every Penny Black illustrated on these items has a different set of corner letters. 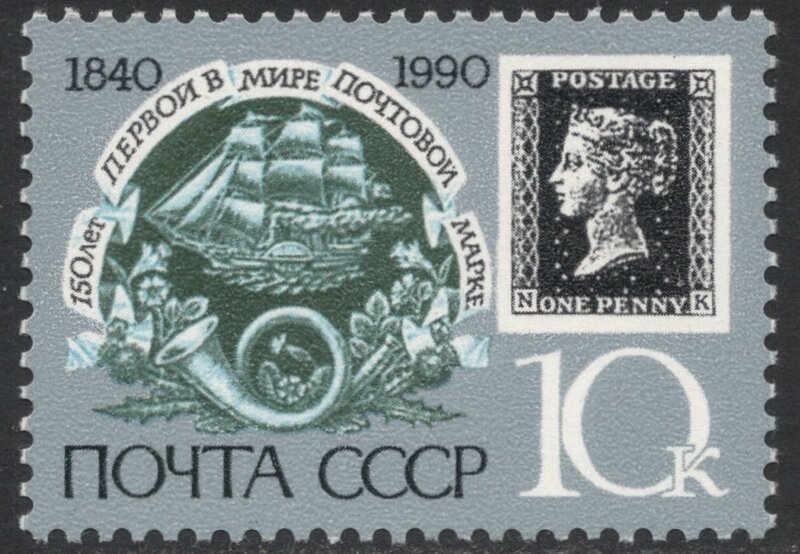 At first sight, this just seems to be an original way of symbolising the many corner letter combinations that may be found on the original stamp. 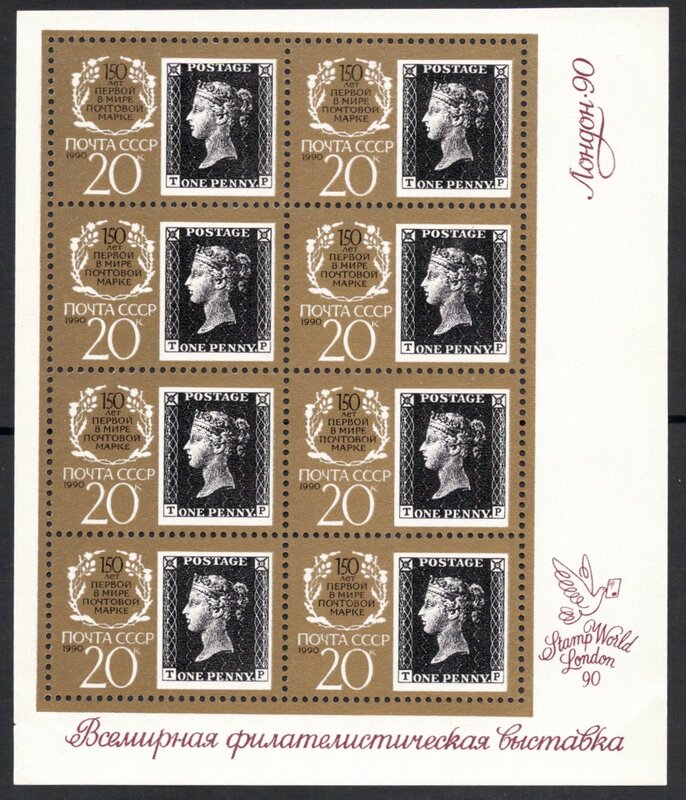 However, the Russian postal authorities discovered to their horror and dismay that the designer of all this, Vladimir Koval, had actually used his own initials on the 35k, his wife's initials (NK) on the 10k and those of his married daughter (TP) on the 20k. Now, the Union may have been on the brink of coming crashing down, but such public display of self-glorification was still very much an offence at the time and the authorities hastened to reprint two of the values with different corner letters, and that's how we also ended up with 20k stamps with the letters TF and a 30k value having AH as corner letters! Ineresting that he used VK for Vladimir Koval. He could have used Cyrillic BK and it would still have looked OK - better, as the B would have been a valid corner letter! Excellent story, and thanks for sharing. Adrian, I've added your site to my "Excellent stamp blogs and websites" list on my own stamp blog because of your consistent wonderful posts. Thanks Jim! I've had a very quick glance at your blog and it looks mightily impressive! As a fellow enthusiast for an 1840-1940 collection I'll be sure to check it out more thoroughly this weekend.